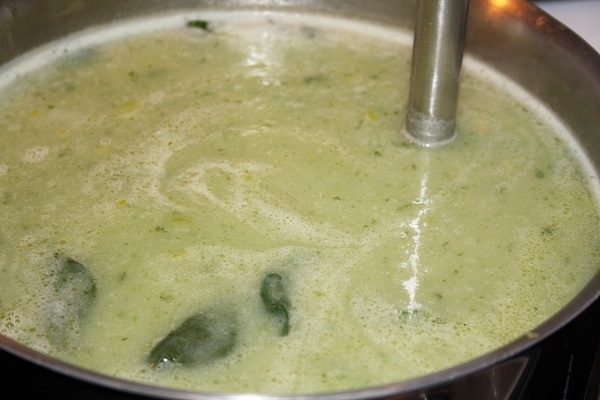 My husband always loves it when I make delicious hardy soups! This was a new recipe that was blog worthy for sure. It was delicious – thick and hearty, creamy, and full of flavor. 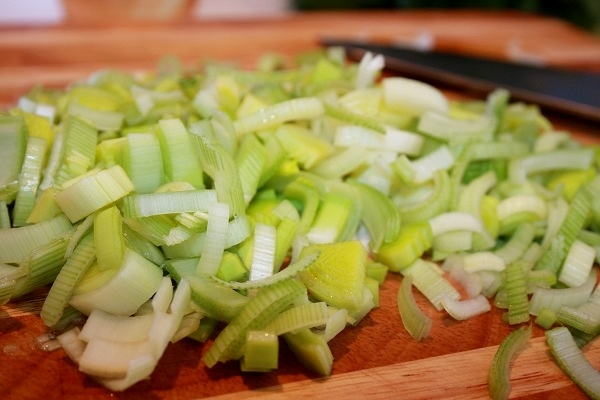 Cut the dark green parts off the leek, so you are left with the light green portion of the stem, then using your knife make a cut down the middle of the leek keeping the stem in tack. 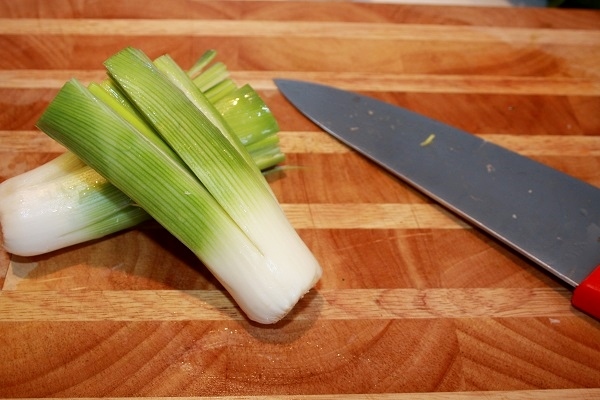 Then flip leek on its side to make another cut. You should end up with 4 sides with base still attached. Then make sure to wash thoroughly to remove all dirt. Slice leeks into pieces about this size, cutting leek with stem in tack helps for a better cutting technique and keeping it together. Sweat out onion, leeks, garlic and spinach. Make sure to not brown or burn onions. 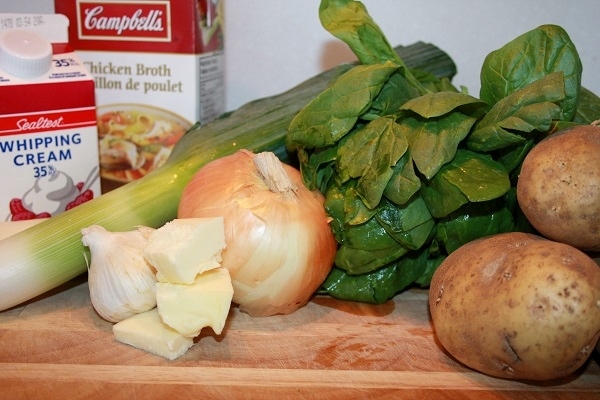 When your vegetables are softened, add stock and potatoes. Cook out soup on medium heat. When soup has finished cooking, (potatoes are soft, check with fork). 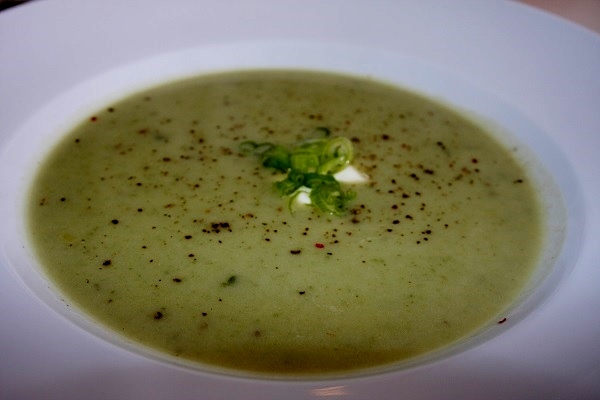 Use an immersion blender to puree soup, add salt and pepper to taste and 35% cream to help thicken and also to add a rich creamy flavour. 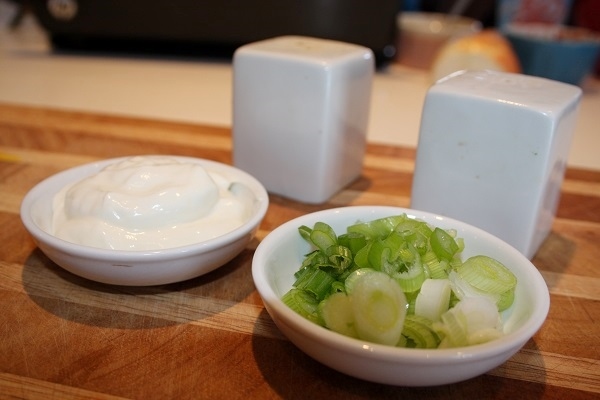 Add sour cream and green onions, or chives for garnish. Melt your butter, then add leeks, onion, garlic. Sweat that mix for about a minute before adding spinach. Then sweat spinach on medium to low heat. Make sure not to brown or burn leeks/ onion etc. Add broth, and bring to boil to heat up stock, then add potatoes and reduce to low and simmer. Cook potatoes until tender. 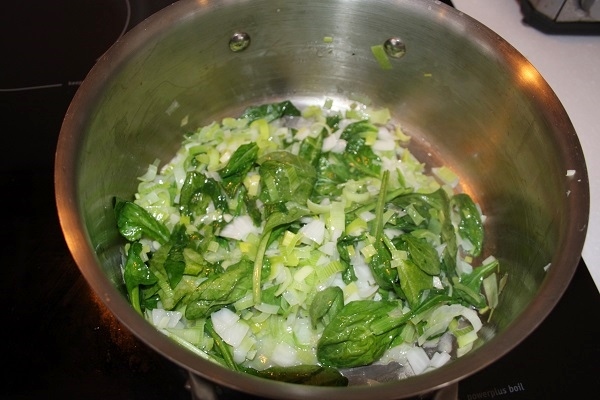 Chef's Notes- Garnish ideas – garlic croutons, fried leeks, chives, or a dollop of sour cream and sprinkling of green onions (as shown). This entry was posted in Recipes, Soups & Stews and tagged Country Hardy Leek and Potato Soup, Hardy Soup, Soup. Sammy, I really like this soup. This year I tried leeks for first time and I’m happy to find anoethr recipe using leeks! Thanks for sharing. Def keeper!